Excellent haikus. And I so agree with the last one. :) Well done. The more challenging paths are less crowded and have the best views. Wow, quilly, I love that! What a great statement…. “onward and upward” should be everyone’s motto… what an uplifting set of haiku, jenn! Would that every pathway were as bright and clear as the one you describe! Newbie here … looking forward to reading all your work! My wish is that all your journeys this coming week are safe and happy for each of you. Til next week, warm regards from the j-b. Wonderful haiku. I’m happy for you. Onward and upward is where I should go, too. Have a great week, Jenn. very encouraging Haiku Jenn love to see and read positive writings they can be infectious! my blog is still D.O.A. so Haiku for me this week, will let you know if/when/ I get it up! sad I missed out this week. Been sick but will be back this week coming up! 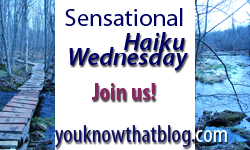 The word for each following week is posted right below my own haiku :) Tomorrow’s is “Freestyle”, which means you can write about anything you like. Loved you bright road haiku. Very uplifting.